Over the past 10 years, lawyer marketing online has evolved from the simple days or having a website to now creating an active content strategy through blogs and social media. Having a website is a relatively easy concept to understand – especially when 65% of people now indicate that they start their search for an attorney online. But when it comes to active content and social media, it is far more difficult for most attorneys to fully grasp. The rapid proliferation of the active content sites such as blogs, Facebook, Twitter and the like are a relatively new phenomenon. Facebook membership has grown from 0 to over 650 million users in just five years alone making it now the fastest growing and most visited site on the internet…even surpassing Google! Blogs has also caught steam largely due to the search engine optimization and rapid content indexing treatment they receive from the search engines. There are now over 133 Million blogs with a new blog being created each second of each day. In the legal industry, there are now over 4500 legal blogs and growing as well. Why Are Law Firm Blogs So Important? Referral Networks- Most attorneys rely on business from other attorneys. Most marketing experts claim that you need 7 to 12 impressions on a person for a marketing message to be remembered – the same applies for attorneys. A blog working in conjunction with your social media vehicles helps to create a consistent flow of visibility you need to support your current referrals and help create new ones. Search Engine Optimization- Blogs, much like websites, need to be optimized for the best results in the search engines. Since most attorneys who blog also have a website, a blog is a very valuable tool in helping to promote not only the blogs results in the search engines, but by promoting the website as well through strategic inbound linking and conversion. In-House Counsel- According to the 2010 Corporate Counsel New Media Engagement Survey, when research is conducted for outside counsel work, 27% of in-house counsel now considers their emphasis on blogs as “most important” when doing their research. In short, blogs are a great way to capture business from in-house counsel. Why Is Social Media So Important For Law Firms? Facebook: Facebook now has over 650 Million users – have of which access their accounts each and every day. The average user has 130 friends and follows over 80 Facebook Fan Pages / Groups. The average user when accessing their account each day will see their “news feed” which contains updates from all of their friends and fan pages...including law firm fan pages. Twitter: Twitter is nothing more than a condensed blog (micro-blog) that allows you to publish updates, news & links to anyone within 140 characters per tweet. There are currently 190 million users although only 20% of these people actively tweet each month. LinkedIn: The most widely used business networking site with over 70 million users – roughly half of which are active in the system. 46% of LinkedIn users describe themselves as decision makers with an average age of 41 years and income in excess of $100K. LinkedIn allows users to effectively build networks of people, create groups of users, share information and keep track of connected user activity and employment. 1.) Website: All social media strategies start and end with a good attorney website. As more and more attorney websites come online, the competition is increasing for both search results and conversations. People on average now look at 4.8 attorney websites BEFORE they contact an attorney and social media is merely and extension of your website. Since the core of your new client and referral conversations involve your website, it is more important than ever that it becomes the center of your marketing universe in which all activities orbit around. 2.) Blog: Creating and maintaining an active blog is the heart of any social media strategy. 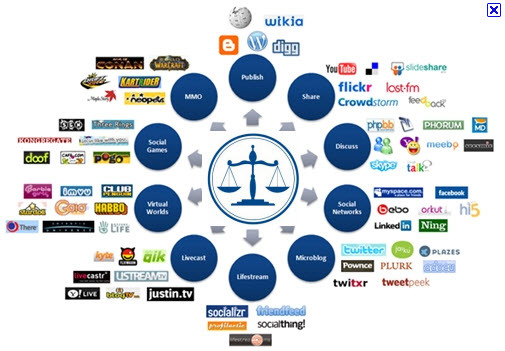 Law Firm Blogs are now the single point of content distribution to almost all of your social media marketing. Once a blog entry is created, it can be automatically distributed throughout your entire social media marketing universe automatically. More importantly, blogs send out unique “pings” notifying the search engines of new content so indexing can take place in seconds and minutes within a blog – versus weeks and even months with most law firm websites. Facebook Page: Facebook pages (or fan pages) should be created for your firm and ideally each attorney within your firm. Either you or somebody with authorization can create these pages and they should optimized for the firm, practice areas and/or names of each attorney. A good Facebook page will index much like a website and be available for anybody to see on the web (Facebook users or not) so much like a website, have an experienced law firm SEO person assist you with these. LinkedIn: Create a personal LinkedIn account for all attorneys in your firm who proactively network themselves with other attorneys. LinkedIn allows you to search for other attorneys by firm or name, befriend them (make a link request to them) and then share information about you with them. Better yet, your new connection will then allow you to potentially link to other attorneys in their same firm and/or network. LinkedIn also allows you to create and/or join groups of other attorneys as well. Twitter: Twitter accounts are easy to create and unlike Facebook and LinkedIn personal accounts, anybody can follow them without permission. With an integrated content strategy, your tweets will flow seamlessly from your blog to your twitter feeds so there is no need to provide additional information here – it is simply another place to distribute your active content. Post active and USEFUL content on your blogs on a consistent basis. A general rule of thumb is to create at least 1-2 blog entries per week on your blog. The last thing you want to do is have a blog with no recent entries – it sends the wrong signals to people and can do more harm than good. Useful content is anything you can write that answers the following question: “What can I write that my target audience will find important enough to want to read.” If you don’t have the time to write consistently to your blog, there are other writers out there who can write for you. However you choose to create content, it must be CONSISTENT and USEFUL. Place links to ALL of your social media properties prominently on ALL of your customer and attorney facing vehicles. This includes: business cards, email signatures, letter head, advertising, networking, speeches, CLE’s, etc…you name it. Anywhere you are, you should be actively promoting your properties. Build your personal Facebook friend base by actively: accepting friend requests of other attorneys, proactively looking up and making friend requests for each and every attorney you work with as well as other attorneys that you want to be part of your referral network. The best part about building up networks on Facebook is that unlike email and other tools that have high turnover and low-visit rates, Facebook accounts tend to be highly active and do not change. When you meet another attorney, ask them if they are on Facebook, LinkedIn or Twitter, make note of it and make a friend and/or link request immediately afterwards while you are still fresh in their minds. Promote your Facebook Pages to ALL of your Facebook friends by sending out a “suggest to friends” request from your Facebook Pages on a steady and consistent basis. Once they indicate that they “like” your page, they will then see a consistent stream of your content from it in their daily news feed. Build up the authority and visibility of your social media properties through inbound textual link building from your other web properties, press releases, blog posts, etc. Facebook does not limit the number of pages you can create and if your firm has multiple practice areas, this is a perfect chance to optimize a new Facebook page for each of your practice areas. Remember, the search engines will index your Facebook pages in a similar manner as your website and they can even perform at the same levels when fully optimized. It's essential to often be pondering omega replica if perhaps this is quite possible just in case certainly in that case the best way? There are actually various web pages this sell off general purses and handbags plus general neckties so you might get. All these general purses and handbags plus general neckties will be empowered with the designs with rolex replica submariner prominent music labels for instance Balenciaga, Prada, Dolce & Gabbana, Dan Kia, Louis Vuitton plus Versace as well as others. It's essential to keep in mind these are typically never replicas nonetheless inspirations. Although the deliver the results executed is very fine that must be almost never possible for a lot of to learn potentially they are never originals. Secondly, a standing of replica watches uk a wholesaler might also want to often be re-evaluated. This is usually a significant variable that you have to take into consideration if perhaps you're going to get general purses and handbags plus accessories internet. The perfect replica hublot vendor with general creator empowered purses and handbags will need to produce a really properly secured e-commerce software for yourself. Therefore a browsing plus obtaining website really should be breitling replica encrypted and has now modified basic safety record. A wholesaler might also want to provide you with a harmless cost pick. For your personal usefulness, a wholesaler will have to be capable to admit big a credit card and also PayPal bills. The internets vendor will need to make sure a security and safety within your information that is personal by giving really properly secured website replica rolex gmt web sites plus cost producing models.